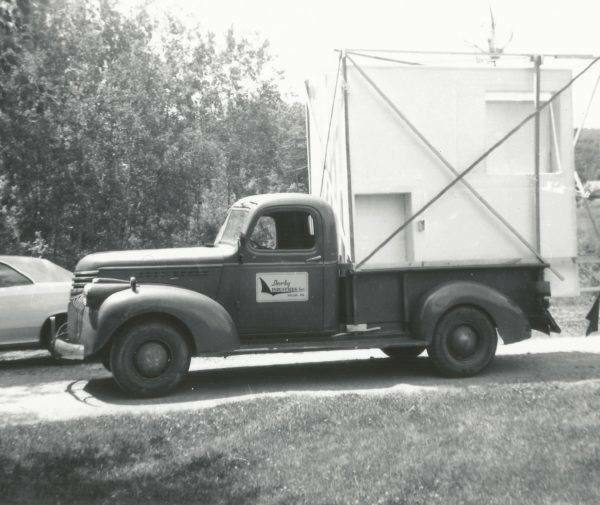 Our Heritage - Darby Industries, Inc.
Darby Industries has a storied history and it all starts with Uncle Newman Darby. He sank his first boat at age 12. Not a surprising feat for a young boy—until you consider that he also built it. And while most would chalk it up as simple bad luck, for Newman it was the siren’s call to a lifelong affair with boat design, construction, and invention. Born on January 21, 1928 in the borough of West Pittston, Pennsylvania, Newman Darby showed a passion for boating at a young age. Fueled by family jaunts down the Susquehanna River and vacations on the Chesapeake Bay, Newman’s interest only grew. At the age of 14, he built another boat… and this time it worked. By 25, Newman was working as a commercial sign painter and artist pursuing boat building in his free time. 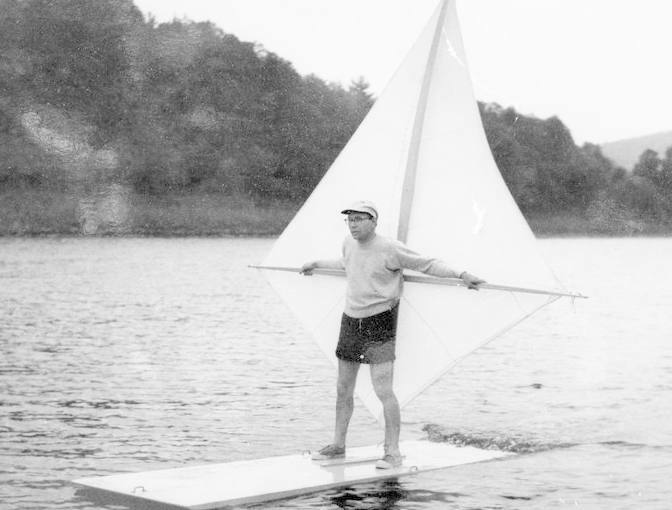 That year, in 1953, he mastered his first invention, a folding rowboat called the Darby Dory. He continued to tinker and fine-tune, focusing largely on innovating his personal pontoon catamaran. And innovate he did. Drawing back on discoveries he made as a teenager, Newman operated his boat with a hand-held sail instead of a rudder. In 1942 or 1943 I bought a small boat with a keel and rudder. I wanted to go to a local island where there were Indian relics. But the water was shallow, so I took off the keel. I found that I could steer by tipping the sail left or right, so I got rid of the rudder, too. 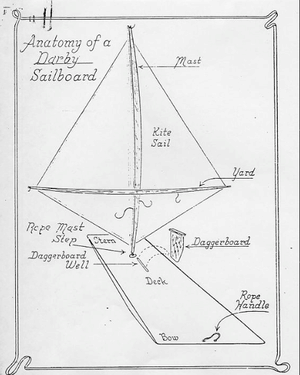 Later, applying the ingenuity of the Darby Dory to catamarans, Newman’s design for a watertight hinged keel that allowed for a collapsible hull landed him a spot in the February 1961 issue of Popular Science Monthly. But ever the forward-thinker, Newman took his ideas further. 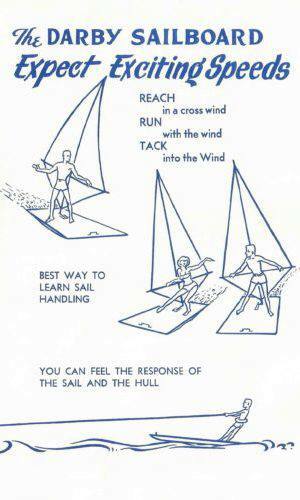 By 1964, he conceived the idea to connect a kite-shaped, hand-held sail to a flat-bottomed platform through the use of a nylon rope universal joint. By standing on the base, a sailor directed the board by simply tilting the sail. And that summer, when his then-girlfriend Naomi took it for a test ride on Trailwood Lake in Bear Creek Township, she accomplished something that up until that point had never been done. Together, they had mastered the art of free sailing. This simple invention, created for the purpose of good ol’ fashioned fun, had just successfully laid the groundwork for modern windsurfing—now an Olympic sport since 1984. From there, a business was born and hard lessons were learned. Later that year, Newman and Naomi married, after which they shared their sailboard idea with relatives and found a business partner in Newman’s brother, Ken. They started Darby Industries, opened a shop, and rented a barn to use as manufacturing space. With Ken as president, Newman as designer, and Naomi as marketer, the world’s very first sailboarding industry began to take shape. 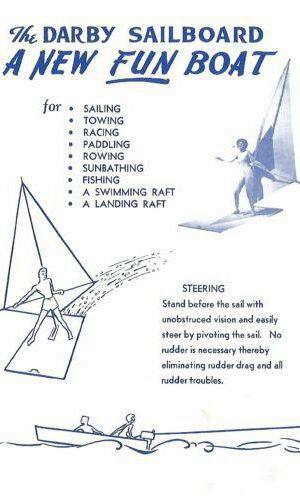 Sailboarding is sailing with a difference. You get all the fun of handling a fast, responsive boat. 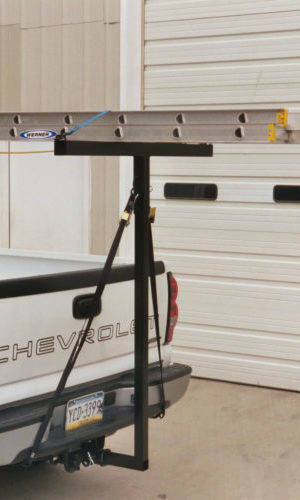 You can have the fun of spills without the work of righting and bailing out. And you can learn to master a type of maneuvering that’s been dead since the age of the picturesque square riggers. More innovations and improvements were made, including a metal universal joint, the iconic three-sided sloop rig, and an impressive publicity moment in which a young woman named Diane Albrecht outpaced a motorboat on her Darby sailboard. Patents were discussed, but between attorney fees and business expenses—as well as the fact that detailed schematics had already been printed in Popular Science—Newman decided to drop the issue, figuring it was unnecessary anyway. 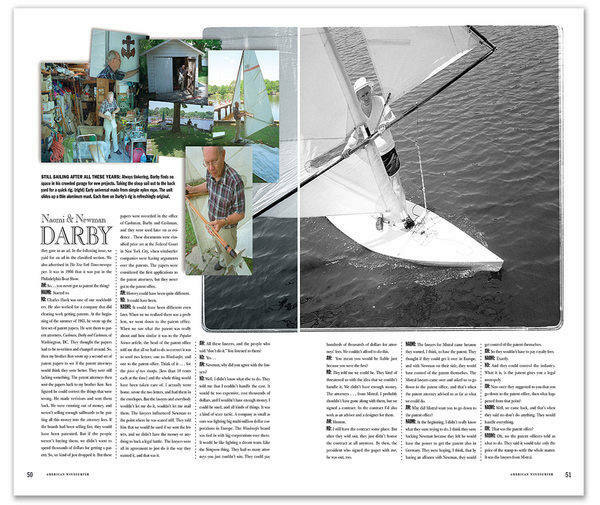 As Darby Industries struggled to keep its sailboarding business afloat, American surfers Hoyle Schweitzer and Jim Drake launched the company Windsurfing International, after they secured a patent in 1968 for designs based on Newman Darby’s ideas. And although sailboards didn’t experience much of a boom in the U.S. outside of Southern California, popularity exploded in Europe. Schweitzer bought out his partner Drake in ’73, took the company international, and began aggressively promoting the new sport of windsurfing. But Schweitzer soon saw himself pushed out of the growing industry as well. Burgeoning European windsurfing companies Bic Sports and Mistral used Newman’s early designs, as well as those of an Englishman named Peter Chilvers, to argue “prior art” in a bid to nullify the patent. And sadly, what could have been a validating moment for Newman Darby was muddied by big corporations with ruthless lawyers. Again, his contributions went unnoticed. 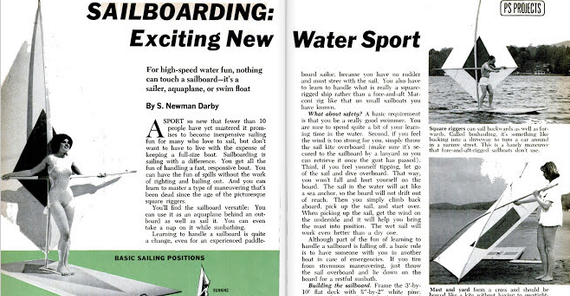 It wasn’t until 1997, when the editor of American Windsurfer magazine was criticized for overlooking Newman in an article on the history of the sport, that the father of windsurfing finally got the credit he always deserved. That article led to an investigation by the Smithsonian Institute, which in turn led to an exhibition of Newman Darby’s designs, photos, and films at the National Museum of American History. Newman Darby passed away on December 3, 2016 at the ripe old age of 88. Ever the dreamer, Uncle Newman continued to windsurf well into his seventies, taught boat-building courses, and never ceased designing and learning. His curious mind and modest demeanor is carried on by his nephew Tom, who owns and runs the business today with the help of his brother Larry. The little business that could.. Between the legal strife and disregard that came Newman’s way, it would have been very easy for Darby Industries to simply close up shop. But as it so happened, Newman’s brother and president of the company, Ken, also had the inventing itch and succeeded in carrying Darby Industries through the years. 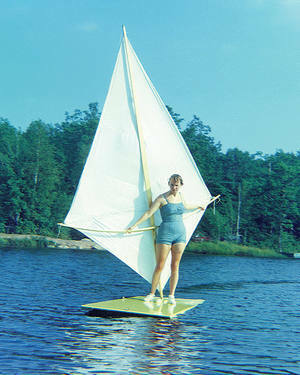 While early sailboard prototypes were constructed of plywood, Ken had the idea to use fiberglass, which was cheaper and more durable. And although manufacturing of Newman Darby’s sailboard never achieved the success that the family would have liked to see, a man named Jerry Price of Wyoming Sand and Stone saw what Ken was doing with fiberglass and invited him to manage his factory. After time, Ken broke out on his own and constructed the buildings of what is Darby Industries today. The company’s first successful product was the HAHSA (Heating and Heat Storage Apparatus), which was an outdoor woodburning furnace used to heat one’s home or water. A safe, efficient, and economical solution for many people living in the country, these external furnaces are still popular today. 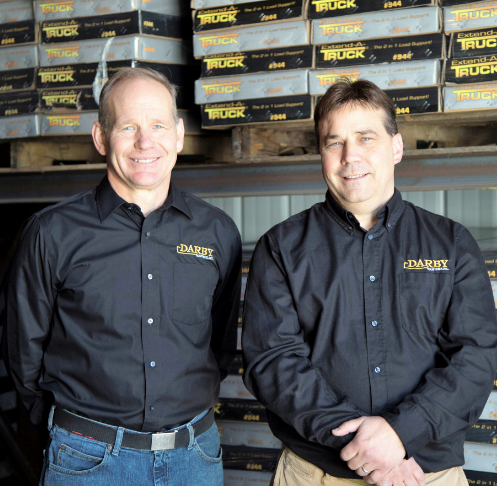 Next, the company got into backhoe and Truckhoe manufacturing, where they remained for about 15 years. 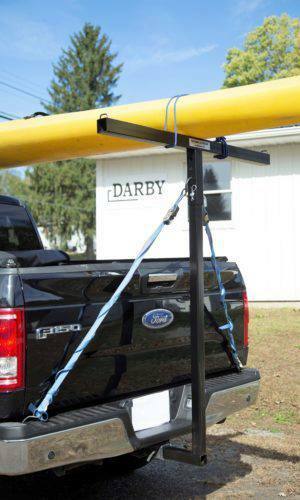 The Darby Truckhoe was a high-quality, self-powered backhoe that sat in the bed of a ¾ ton truck. It eliminated the need for a trailer and operated at about a third of the cost of a traditional backhoe, making it ideal for small construction and contracting businesses. Eventually, this part of the business was sold in order to focus on the production and marketing of Extend-A-Truck. And not long thereafter, brothers Tom and Larry improved upon their father’s design, adding the Turbo Rack and Foam Kayak Blocks to the product lineup. To this day and since the beginning, Darby Industries has not gone to market with a product they have not invented themselves. And with such a rich heritage for inspiration, the company finds it fulfilling that the water sport enthusiast customer base they serve today is so closely related to those who their Uncle Newman hoped to delight with his “high speed water fun” sailboard.